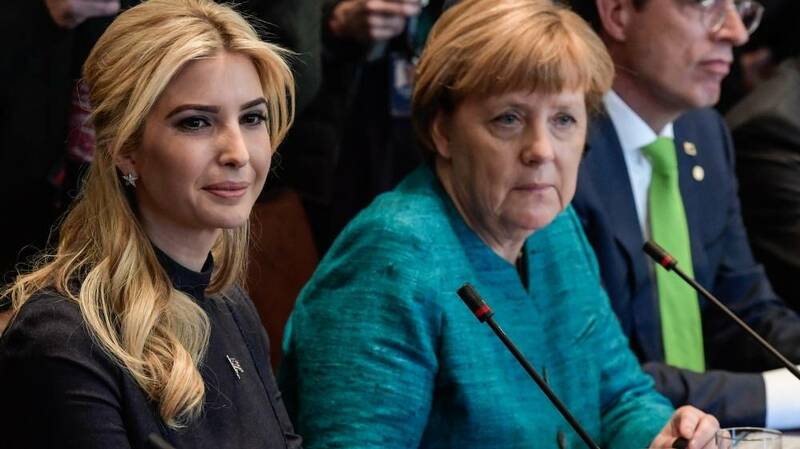 Ivanka Trump seated next to German Chancellor Angela Merkel at a White House round-table discussion. Ivanka Trump has taken on an official job as assistant to the President of the United States, for her father, Donald Trump. Even though she has publicly stated she won’t take a salary, ethics experts have said she would have to be extremely careful in trade negotiations with countries that export clothing for her label. Just has her husband Jared has a seemingly endless list of priorities and responsibilities, Ivanka’s role is equally as “unknown.” She has been called “assistant to the President” and has shown up for meetings with foreign leaders with no prior experience or official title to be present at such meetings. Ethics experts are concerned because of Ivanka’s clothing and accessory line she continues to market for profit while performing policial duties. In section 208, it prohibits an executive branch employee, which would technically be Ivanka, even though she is refusing monetary compensation, from participating in a Government matter which would affect her own financial interests. Trump is well-known to not trust others outside of his own family when it came to important business matters, and the same holds true how he is creating his circle of trust at The White House. He has unqualified family members in critical positions of power, which have raised the eyebrows of many. While his two sons do have roles, it is Ivanka and her husband Jared, who have roles of real power, just as they did in the business dealings with Donald Trump before getting elected to the office of President. As long as Ivanka focuses on the areas of women’s rights, climate change, and the Middle East, while not stepping into trade policy, she will be on safe ground. However, if she steps into trade policy and is involved with countries that are directly tied to her export business with her clothing line, that could bring up criminal charges per the law. Even if she feels she is acting in the best interest of the country, because since she can directly profit from the policy, that could make it criminal, despite and good intentions. She is a quiet, yet powerful presence and all eyes are on her to see what she will do next.